Veteran Goodwin Alco loco 4833 has received an early christmas present this year thanks to the professional efforts of the oldmates from Drivetrain, Maywald Engineering International, Col Parry and the Lithgow Suit club. Having worked tirelessly for many years, 4833 has been the subject of extensive repair and overhaul works in recent weeks which should prepare it for many more years of reliable service. various mounting repairs as well as air brake component change outs and pipe work repairs it should be no surprise that the receipts now total in the vicinity of $90,000.00. Add to this the Compressor overhaul, traction motor blower refurbishment and electrical inspections completed in previous months and theres not much left on the list of planned works to tick off. Commitments like this are a necessary part of essential maintenance programs and thanks to the efforts of our willing workers our 48 should continue to be the “backbone” of the fleet. Thanks guys, we hope you enjoy your christmas break. After a marathon restoration historic NSWGR Alco locomotive 4001 has returned to active duty 37 years after it was withdrawn from regular service. 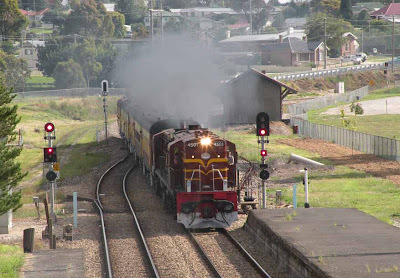 The 40 class were the NSWGR’s first mainline diesel locomotives and survived until the ordering of 442 class locos in the early 1970’s, when they were destined to become donors of parts and scrapped. 4001 was saved for preservation and its restoration is due to the combined efforts of numerous RTM staff, volunteers and supporters over various eras with many missing components required to rebuild the loco being donated. Goodwin Alco was pleased to be able to assist the restoration progress firstly with the supply of fan and oil filter components to former Maintenance Manager Jim Martin and more recently via the commissioning and donation of reproduction MLW builder and Alco design plates. Sporting a shiny coat of fresh Blue paint, 4001 was recommissioned on November 20th and has subsequently hauled 2 tour trains for fans celebrating its restoration. Unfortunately 4001 suffered a fan drive failure during its 2nd outing to Bathurst but is hoped to again be returned to heritage service in the near future. Congratulations to all involved in the restoration of this historically significant old Alco. On Saturday May 29 former Patricks locos 7307 and 7321 commenced the first leg of their final journey to preservation being moved from Botany to Eveleigh by Goodwin Alco locos 4501 & 4833. Despite the gloom of a wet Sydney day spirits were high amongst the faithful volunteers who had gathered and volunteered their time to ensure that the units recently purchased by the Oberon Tarana Heritage Railway were safely transferred and secured. Having been the subject of some theft and vandalism at Botany and purchased “as is, where is” the combined efforts of the Lachlan Valley Railway, 3801 Ltd and Goodwin Alco joined forces to prepare, transport and secure the engines ready for their journey West to their final home. Thanks to the generosity of Lachlan Valley Railway who moved the locos at cost, 3801 Ltd who provided temporary shelter and workshop facilities at Eveleigh and Goodwin Alco who donated the use of locos 4501, 4833 and the fuel used for the transfer, the Walkers built locos are now undergoing repair and recommissioning works. Soon the move west to Tarana will be possible and the OTHR locos will commence the next stage of their service career and enter their second period as preserved units. Goodwin Alco wishes OTHR well in their endeavours and encourages anyone interested to support their activities via physical and financial support to preserve and reopen the unique “pioneer” line from Oberon to Tarana.